Tinctures have been used in homeopathic healing for generations, and the remedy’s success can be attributed to the infusion and preservation of nutrient dense herbs, roots, and plants in alcohol. Rather than reverting to over the counter (OTC) cold and flu pills and syrups, which according to the lapa‘au tradition are thought to exacerbate the illness, why not decolonize your medicine cabinet and concoct this warming and restorative cold and flu tincture? While I hope that you find this information helpful, please keep in mind that I am not a licensed medical practitioner. This information is not intended to replace the medical knowledge of your naturopath or physician. In the case of an emergency, please contact your healthcare provider and call 911. Top L-R: ‘uhaloa, pōpolo, neem. Bottom L-R: garlic, ginger, nīoi. *I recommend using organically grown ingredients to ensure that the tincture is pesticide free. Also, dried or fresh leaves can be used in this remedy. The following medicinal descriptions are not comprehensive, but are rather a glimpse into the healing nature of the plants. This information was passed on to me by Kumu Keoki Baclayon, a kahuna lā‘au lapa‘au and cultural practitioner, and was also gathered through texts including Hawaiian Herbal Medicine: Kāhuna Lā‘au Lapa‘au by June Gutmanis and Isabella Aiona Abbot’s Lā‘au Hawai‘i: Traditional Hawaiian Uses of Plants. ‘Uhaloa – An excellent herb for maintaining respiratory health. Aids in decongestion, treating bronchial infections and asthma, and in the healing of sore throats. Pōpolo – Helps to treat respiratory problems and ease body aches. Comfrey – Also known as “bone-knit,” this herb is often used externally for wounds and abrasions. Internally it is used as an anti-inflammatory. Neem – Prominent in Ayurveda, this herb wards off infections as it is anti-fungal and anti-bacterial. 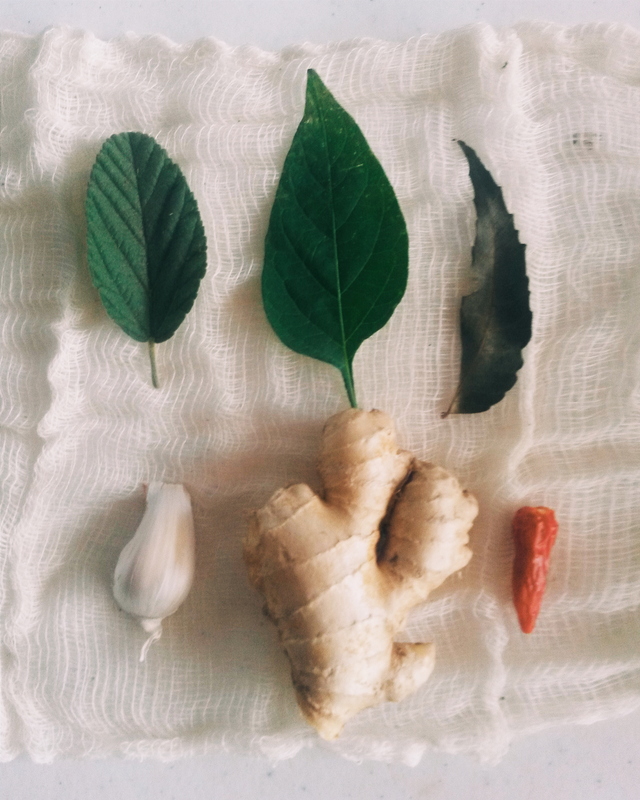 Ginger – Warming and spicy, this rhizome has been used to help with nausea, indigestion, and vomiting. It is anti-infammatory, anti-fungal, and anti-bacterial. Garlic – Anti-fungal, anti-bacterial, anti-viral, this herb fights infections and acts as a vasodilator. It also helps ease headaches and respiratory ailments. Nīoi – Vasodilator that aids in circulation and oxygenation. Allows other plant medicines taken along with it to be more bio-available. Helps to eliminate headaches and fatigue. Follow ethical gathering protocol when foraging, harvesting, and wildcrafting plants. Set intentions and pule over lapa‘au. Give thanks to the plants for their healing properties, and have a pono heart throughout the process. Tear up leaves, combine in jar. Tearing the leaves allows for easier release of the plants’ essential nutrients. Slice or grate ginger and add to jar. Slice or mince ginger and add to jar. Leave nīoi (Hawaiian chili pepper) whole or slice in half lengthwise, and add to jar. Cover lā‘au with vodka, shake, and pule that the medicine fulfils its purpose and heals those who need it. Allow lā‘au to steep for one moon, starting from new moon and ending at the next new moon. 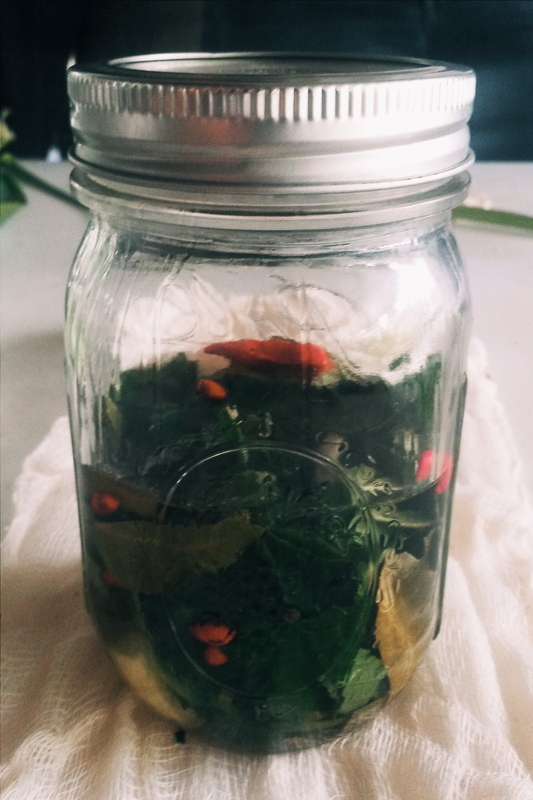 Before use, shake jar vigorously every day and pule, infusing healing properties into the medicine. When ill, take one teaspoon of the remedy three to four times a day for 10 days. I hope you enjoy this recipe! Please let me know in the comments if you make this tincture and whether or not it worked for you.